was again #4 for milk and #3 (tie) for protein on the 2013 ADGA Breed Leader list. 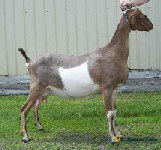 305 Milk Production award and was again on the 2012 ADGA Breed Leader list. 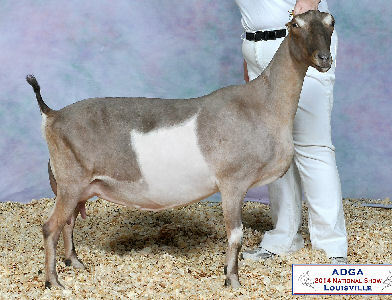 show out and was #9 (tie) for Milk and #10 (tie) for Protein on the ADGA Breed Leader list for 2011. What an amazing doe!! We were thrilled when this little doe was born...her dam had never given us many does and to get one out of Outlaw was a double bonus. 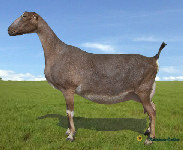 Caramel was a very correct, growthy doeling standing on outstanding feet and legs. We couldn't wait to see her freshen and we certainly weren't disappointed. 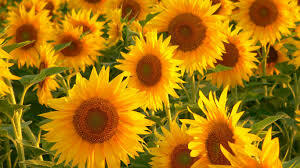 Caramel is tall and dairy and smoothly blended. 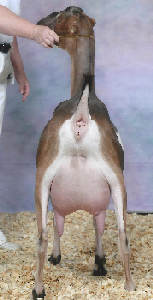 She is a very long-bodied doe and she freshened with a gorgeous mammary. 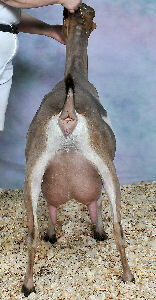 Her udder is high and wide in the rear with a very correct teat size and placement and a long smooth fore udder. Caramel was 3X 1st place senior yearling milker and finished the 2010 show season off by winning Grand Champion Senior Doe and Best Udder of Breed at the Fall Fuzzy Show!! We were thrilled when she appraised VG88 as a yearling!! Caramel completed a nearly 2800# milk record as a yearling milker and came back looking even more amazing as a 2 year old. 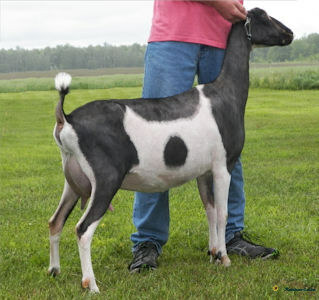 She was GCH senior doe in both rings at our first show of the season finishing her championship and continued to milk at the top of the herd. She has one of the most outstanding udders in the herd...high and wide in the rear with an amazing escutcheon, long, smoothly attached fore udder and nearly perfect teat placement. As a 3 year old Caramel came in and seriously took our breath away. 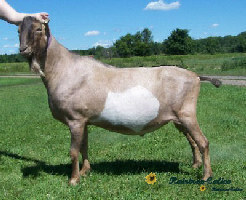 She had developed into a powerhouse doe yet retained her beautiful dairy stremgth and style. Her mammary is simply stunning....high and wide in the escutcheon with a tremendous area of attachment, long and smooth in the fore udder with wonderful capacity. At the first show of the season, Caramel was 5X BOB, 4X Best Udder in Show and 3X Best Senior Doe in Show in some stiff competition. She would have been our top doe for Nationals had we been able to go. In 2013, this lovely doe just continued to amaze us. As one exhibitor put it at our local show, "She never ages and just continues to get better and better." Caramel was again 4X BOB, 4X BUOB, 3X BSDIS and 3X BUIS at our local show. She was the 10th place 4 year old at the National show and was awarded the High Individual 305 Milk Production award. 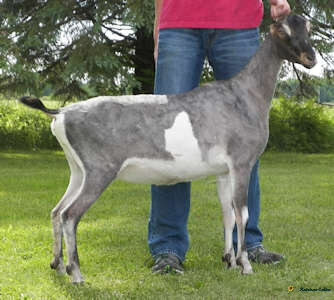 She is again listed on the 2012 ADGA Breed Leader list. very respectable 13th at the 2014 ADGA National show. 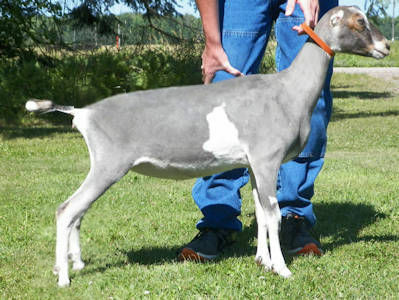 She was again on the 2013 ADGA Breed Leader list. She then appraised EX 91 (permanent score) after being fresh for 17 months. 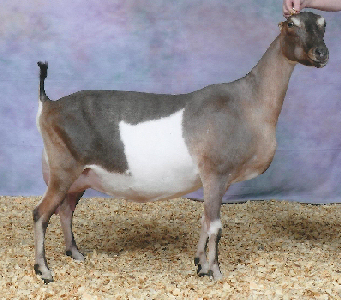 Despite being in milk nearly 19 months, Caramel again amazed us when we took her to the National Goat Expo in late September 2014. She was 6X BOB, 6X BUOB, 6X BUIS and 3X BSDIS. We look forward to seeing her fresh again in the spring of 2015. In 2015, Caramel surprised us with a set of lovely triplets on New Year's Day. 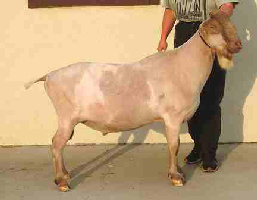 One of her bucks headed off to Canada and we chose to retain her other buck and her doeling in the herd. Caramel started this lactation off with a bang as she normally does but faltered about 90 days in showing a poor appetite and lower milk production. Taking her to the University of MN Large Animal Hospital, she was diagnosed with acute rumen acidosis which had caused liver problems. A long recovery followed and she valiantly tried to regain her milk production but we felt it better to dry her up and give her the time to return to her healthy self....when she started pushing her entire pen around I knew she was back. Caramel freshened in January of this year with a lovely single doe kid...a real keeper. Although she didn't peak as high in milk production as in past years she has held a respectable 12# throughout her lactation so far. We felt that her health was finally back to normal and decided to try for one more National Show so she made the long trip to Harrisburg and she looked amazing on the day of the show. Leaving her in a holding pen to show in the class before hers I came back to find that someone had carelessly tossed a pair of hoof nippers in her pen and she had sliced her front foot. Thus ended my hopes of her back in the show ring as I scratched her to tend to her bleeding foot. I truly feel she would have been very competitive in that older class this year. 2017 turned out to be another tough year for Caramel and we feel extremely fortunate to have her in our lives. Our tremendous thanks to the University of MN Large Animal hospital for saving her life in June when she presented with a bladder blockage. She spent 4 days at the vet hospital and has returned home and is doing well. We will continue her on preventative treatment and hope for the best. The stay in MN was very hard on her and we would like to see additional weight on her but she continues to milk much better than expected. After taking 2018 off to recover from her bladder ordeal, Caramel has returned to her normal weight and state of health. 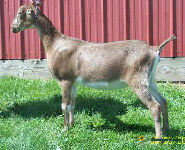 We have hopes to breed her this year but will not take deposits on any kids until we are sure she is confirmed bred. All does and 1st buck will be retained. She will be bred to Merlin for January kids.